Another WEE WORKOUT Parent Speaks UP! Tucked away in a little corner of Los Osos is a magical little land called WEE WORKOUT. Owner/facilitor Marlene Rosen has transformed a seemingly ordinary space and time into a highly varied and stimulating "event" for children (ages three months through 4 1/2 years) and their parents. At Christmas, for instance, a model train chugged along on an elevated track with a holiday display and cat-walks as observation decks. Another toy train allowed little riders to circle a small decorated tree that amazingly stayed intact despite its numerous temptations for toddlers. 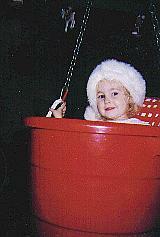 A red bucket "swing" with green ornamented parasol carried a beaming youngster (bedecked with Santa hat) aloft. In another corner an enchanted "peek in" area had a gathering of teddy types "listening" to carols as a set of lights kept time to the musical accompaniment of small bells. Themes at WEE WORKOUT vary frequently -- you should have seen Halloween! Children and their parents or grandparents experience the breadth of Marlene's imagination as they play on a constantly evolving framework of swings, slides and climbing structures. Free play alternates with structured activities like songs with movement or musical instruments, a much-loved parachute "ride", bubble extravaganzas and an ever-changing parade of challenges. As a huge bonus for parents who could use an occasional parenting tip, Marlene (a mother of five, with grandchildren besides) shares ideas, experience and structure that make parenting easier. She strives to provide young children with an hour of undivided attention with their often busy parents. Thriving in this safe, small-group setting, the children also gain a sense of both self-importance and responsibility for their actions. 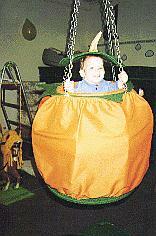 Their WEE WORKOUT experiences can ease a child's transition into preschool and other social situations as well. Basically it's just a wonderful place for kids to meet other great kids and parents to meet other caring parents. Beyond this, WEE WORKOUT is just plain fun! Come catch a glimpse of Los Osos' own "WEE WONDERLAND"